I have a confession to make: Supper was late last night. But I had a really good excuse. Well, I least I thought it was good excuse. I got a new cookbook a few days ago and yesterday was the first chance I’ve had to set down and spend a little time reading it. Yes, I read cookbooks. But that’s another confession. My intent yesterday was just to sit down and leaf through a few of the pages. Well, let me tell you that once you pick up this cookbook you’re not going to want to put it down. It’ll make you laugh and it’ll make you cry and it’ll make you hungry. It’ll take you back to a place and time where life wasn’t quite so hectic and once you start down that road there is no turning back. That was the reason why supper was late. It really wasn’t my fault. It was all Christy’s fault. She is the one who wrote the cookbook. So technically, she made me do it. Do you want to know the name of the cookbook? It was Southern Plate: Classic Comfort Food That Makes Everyone Feel Like Family by Christy Jordan. About a month or so back I stumbled across her blog, Southern Plate, Recipes from below the Mason Dixon Line. I have been addicted to it every since I discovered it. Every day, I have to feed this addiction. I have a pretty bad case of it. Truth be told, I was born north of the Mason Dixon Line but I’ve been a southerner at heart for as long as I can remember. My dear sweet Great-Grandma was from Nashville, Tennessee. If she would have stayed put, when she married my Great-Grandpa, I won’t be a Yankee. I have never forgiven her for that. I have some pretty deep physiological scars from that one. Scars so deep, I’ve purposely passed them on to my own children. The way if figure it is I shouldn’t be the only one to suffer. Oh and believe me, they could tell you stories that would bring shame to most families. Expect, I’m proud of my southern roots so it doesn’t bring me any shame. 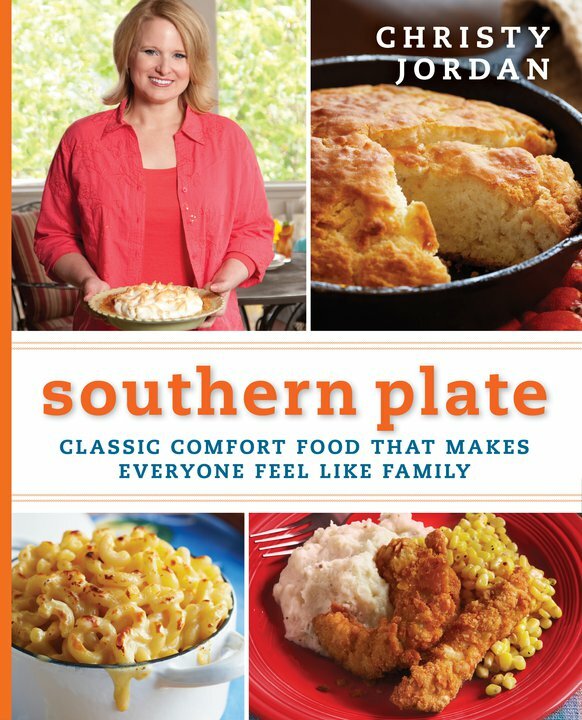 In honor of my southern roots, I’m going to have a contest and give away a copy of Christy Jordan’s book, Southern Plate: Classic Comfort Food That Makes Everyone Feel Like Family. Mandatory: “like” Cheapskate Café on Facebook and come back and leave a comment here, letting me know. If you already “like” my page just let me know. Extra Entry: Let your friends on Facebook know about my site and the giveaway by posting a link to my blog on your Facebook Page and send me a message telling me you did it. I will be taking entries until midnight (EST), October 31. Winner will be randomly selected and announced on November 1. I “like” on Facebook! I’m also a Yankee with Southern roots!! First visit to your website today and I liked it on my Facebook! And I really do like it!! I’m excited to start exploring!!! Blessings!!!! I suggested your website to all of my friends!!! Blessing!!!! I shared your website on my Facebook page!!! Blessings!!!! I just “liked” you on Facebook. Nice to meet you. I have a feeling I’ll be back for more! “Like”d your page and sharing with friends. I need that cook book! Just “liked” you on facebook when I was the Southern Plate Cookbook giveaway contest. I’m just learning my way around but I do believe I will be in here quite often. I just liked your page on facebook…and I am glad I did, thanks for posting about the coffeemate coupon!!!! Kathi Miller Spence Come on over and check out the awesome Cheapskate Cafe – while you’re there – become a fan and enter to win one of the fabulous cookbooks of Christy Jordan’s Southern Plate! Please enter me for the cookbook. Love your site very helpfull! !